The maxi dress was always the cover up of choice for summer – boho chic and relaxed for long walks along the shore in the evening. This season’s update comes from the A-line midi skirt. Finishing just above the ankle, pastel shades like baby pink or white are perfect for summer and they look great dressed down with metallic flip flops and a cute t shirt or dressed up for cocktails with low block heels and a crop top. For short girls, like me, it can be difficult to find a length that fits and so I’m going to be rifling through petite ranges to find the perfect length for me. I love this one from Lauren Pope’s In The Style range. To be fair, it took me a while to get used to these shoes as I was worried they’d make my already short legs look a little bit stumpy. However, my mum (style icon that she is) persuaded me that they’re awesome. The low height of the heel means that they’re super easy to walk in which makes them great for a holiday – we always end up walking miles around the towns after we’ve had dinner. Again, I love pastel colours for summer but these would also be great for the office in black. 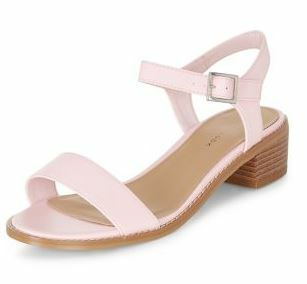 These pink block heels from New Look are almost the perfect pair of sandals, I just wish the heel was a teeny tiny bit higher.